Red leaves adorn a tree during the Autumn season before dropping off in Algonquin Provincial Park in Ontario, Canada. Algonquin Provincial Park in Ontario, Canada is spectacular in Autumn as the leaves on the trees change into magnificent colors before tumbling to the forest floor below. This tree holds on to most of its red colored leaves but it will soon be barren branches once these leaves drop off. 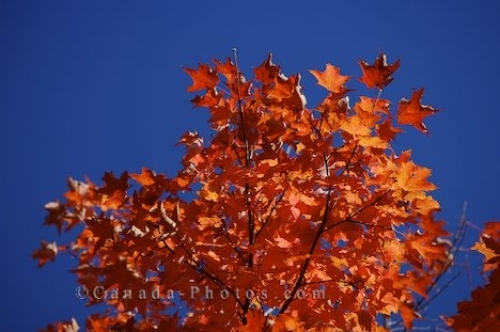 Picture of a tree filled with Autumn red leaves against the blue sky in Algonquin Provincial Park in Ontario, Canada.